Author-signed copy Special Offer £5-95 + P&P. For a single P&P charge of just £2-95 per order, books are sent by First Class post in the UK and by Air Mail to other European countries. Use your Credit Card, Debit Card or PayPal Account via our secure on-line payment system. 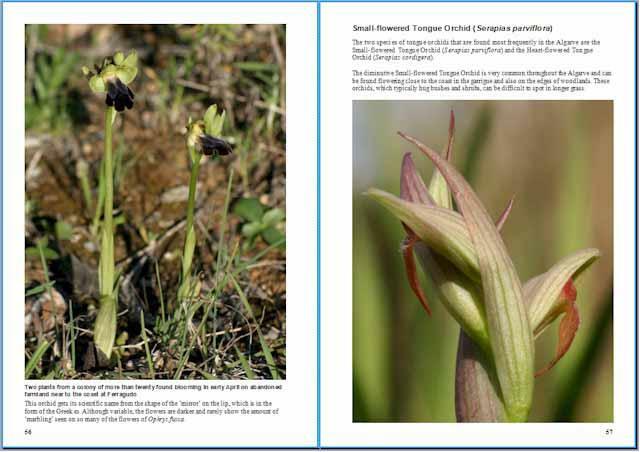 A beautifully illustrated guide to finding and identifying wild orchids in the Algarve. More than 100 large colour photographs. Details of dozens of the Algarve's amazing wild orchids and their habitats. 'Where and when to look' advice plus a site location map, details of the Algarve's nature reserves and other orchid walks. Since its launch in 2009 this book has been consistently in the top three on the Algarve non-fiction bestsellers list. All pages are lavishly illustrated. In-situ and in addition where appropriate closeup photographs complement the descriptions to help with the identification of wild orchid species. What a delight it is to come across a book that provides such helpful advice and beautiful pictures to help visitors to this wildflower wonderland. I particularly value having a map as well as location information for the dozens of wildflowers that grown in southern Portugal in springtime (December to May being the key months). The scientific names are included for those who prefer to work that way. A pocket guide that is excellent value for money and beautifully produced. Ten out of ten! Sue Parker has made a detailed study of the habitats and hotspots preferred by the species of wils orchids that occur in the Algarve, Portugal's most famous and ecologically-rich region. Details of habitat preferences, flowering times and other clues to finding orchids. Advice on some of the most prolific wild orchid sites, with directions for "orchid walks" and which species can be found there. A well illustrated and modestly priced introductory guide, ideal for visitors to and residents of the region. There are many more reviews like these, both in wildlife and countryside magazines and online. Born in Tenby in South Wales, after living in many other countries and travelling the world as an essential part of her job as director of a media marketing company, Sue now shares her time between her homes in Wales and in the Algarve as well as travelling, mainly in Europe, to see, photograph and learn more about wild terrestrial orchids. Sue Parker's passion for wild orchids dates back to her childhood in the Far East, where epiphytic orchids grew on the fence at the bottom of her garden, and the tropical countryside abounded with orchids as well as many other beautiful exotic flowers. To date Sue has written eight books about wildflowers, including three that are devoted to terrestrial orchids. She has also made radio and television programmes about orchids and continues to contribute articles to countryside magazines. This book uses the commonly accepted term wildflowers, rather than wild flowers. 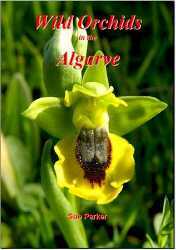 Whatever your preference the wild orchids illustrated and described in this guide book are some of the most beautiful flowers to be found in the Algarve, southern Portugal.